Passionate about…Jesus and winning. The way I see it, if I win and don’t have Jesus then I lose. So I want to win, I want to be successful and leave a legacy, but if Jesus isn’t mentioned when my name is…then I wasn’t successful and I have no legacy. Most recently I…expanded my product line to include outside the waistband holsters, wallets, and paracord bracelets. Mounts should be in store by Christmas. Lamb Tactical brings safety and accessibility to firearm carriers by providing a quick detach mounting system, never exposing the trigger. Origin? Every time I had a holster on and entered my car, it was very uncomfortable on my hip. I would have to take my gun out of the holster and expose the trigger to put it on the center console. I went to the shop and decided that I was going to construct something. There had to be a better option. With Lamb Tactical, access to firearms are quick and safe. You can now take the holster off your hip and clip it on the mount in any vehicle. Today,we aren’t just selling holsters and mounts. We are selling what we believed should always be present everyday with any firearm carrier — safety and confidence. 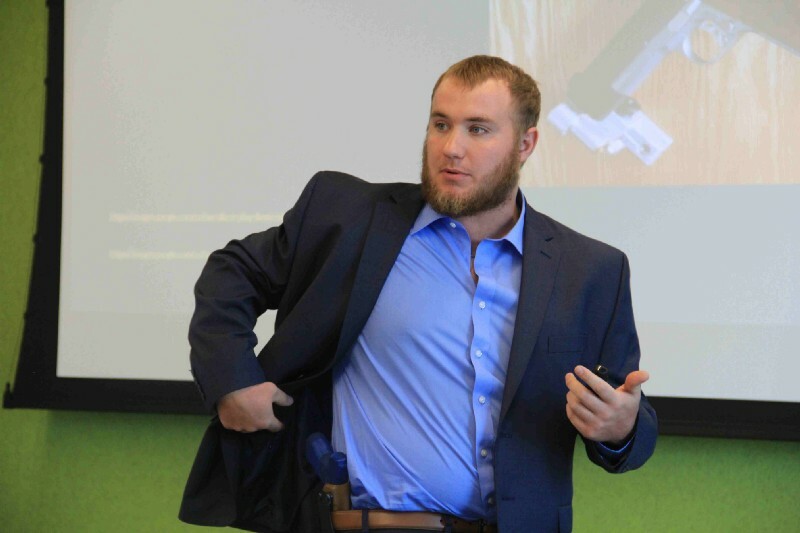 Tyson Lamb, founder of Lamb Tactical displays how current methods for gun safety are not always comfortable for gun owners. Most gun holsters sit on an owner’s hip, which creates discomfort any time you sit-down. Lamb Tactical is solving this problem through their patented mounting system to be used first in vehicles. Right now we are selling to gun shops, retail stores, direct customers, and police officers. I gave away my first 15 holsters at no charge so that people could test the products. As of now, I have sold about 100 custom holsters. Each holster takes about one week to make after ordering the material. Eventually, when the demand is high enough, I am going to need to hire people because each holster takes roughly 2 hours to make. Something that I’m excited to offer is special discounts for active duty, first-responders and veteran customers! YouTube was a great source. I often watched Andrew Henry and Jon Hauptman with Phlster Holster. Unlike some forums, they gave out information for free. For a month straight, 3 hours a night I would watch videos on how to make custom holsters. I figured out what I was doing wrong from the videos and improved from there. How has ISU influenced you as an entrepreneur? The two things that have made me successful as an entrepreneur have been AgEI’s Incubator and CYstarters. Between the two programs, it’s provided my startup with the right resources to grow as company. I’ve enjoyed the CYstarters educational sessions and collaboration. It’s allowed me to realize my strengths and weaknesses. I have learned that as an entrepreneur it is essential to delegate. My advice is simply to listen and adapt. Many people start something and it begins to fail but instead of adapting, they keep pushing it. If you want to do something great, you have to accommodate with the market. 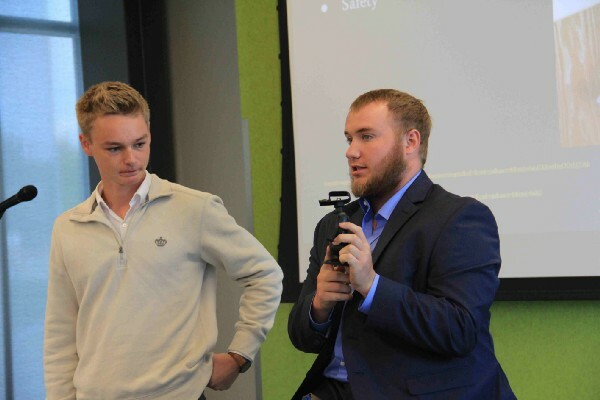 Tyson Lamb demonstrates the mounting system he is creating for Lamb Tactical at the CYstarters Celebration event at the ISU Economic Development Core Facility on July 28, 2017. You can find Lamb Tactical on Facebook (click here). Otherwise, feel free to drop me a line at 641–660–6777. I love talking to future customers and industry partners!